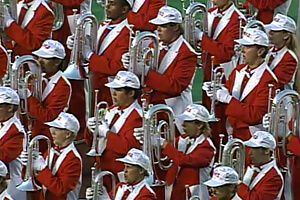 It was quite cold at the DCI World Championship Finals at the University of Wisconsin's Camp Randall Stadium in 1992. How cold? The weather history for Madison reveals that the temperature on Finals night dropped down to 41 degrees, tying the record low set at the DCI World Championships in Montreal in 1982. However, the Cavaliers were red hot, winning their first of seven titles with "Revolution," the closing piece commemorating an 1819 revolt in England. The corps edged the Cadets of Bergen County's "To Tame the Perilous Skies" program by a half a point. The Cadets surged at the end of the summer after placing as low as 6th just a few weeks earlier. Many other corps were hot as well, as this was the first time in DCI's two decades that as many as nine corps broke 90 points, with Blue Knights hitting that score on the head. Velvet Knights first earned a spot in the Finals in 1984, then enjoyed six more appearances among the Top 12 before falling out in 1991. The 1992 season would be the last time the corps was a finalist, and there would be four more productions before the Velvet Knights disbanded after the 1996 season. The corps' 10th place "Magical Mystery Tour, Part 3" was a tour-de-force of comic relief. The first "Magical Mystery Tour" in 1987 took us to Chinatown, Brazil, Africa and California. "Part 2" the next year visited Greece, Spain, Africa and the USA. "Part 3" went back to Brazil and added Japan, the former Soviet Union and Hungary, along with an opera critic shark. The corps started the show by singing, "We love to fly, and it shows," the advertising slogan introduced by Delta Airlines in 1989. As with VK's previous two "Magical Mystery Tour" shows, the corps exploded from the start with a fanfare based on the Beatles' tune of the same name. The end of the fanfare culminated with a flag toss over the horn line, with one member instead tossing a doll dressed as a green-shirted DCI judge. The first full production was of Brazilian songwriter Russell Barroso's "Brazil," written in 1939. The song didn't achieve fame until Walt Disney included it in his 1942 animated film, "Hello, Friends" ("Saludos Amigos"), featuring Donald Duck, Goofy, and introducing Jos?© Carioca, a Brazilian parrot. The tune was utilized in the fourth and final segment of the film, introducing Donald Duck to the samba. Velvet Knights landed in Rio just in time for the celebration of Carnivale, dancing without inhibition. When the brass players suddenly turned to the back of the field, the solid white of the corps' capes and the white stripe added to the back of the pants presented a different look from the red of the uniform fronts. As was the rest of the show, whimsy played a huge roll. 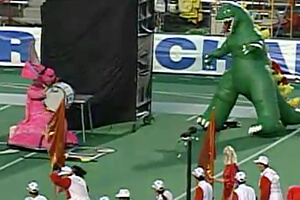 "Kodo Thunder" was an original work written by the corps' percussion staff. Based on the Kabuki Theater, the piece visually explored the martial arts, mostly through the use of two costumed Japanese warriors. And in the true spirit of Japanese films, the Energizer Bunny, playing a bass drum, came out from behind a large set to take on Godzilla. However, he thought better of the action and turned around to "keep on going" another day. In "Carol for the Russian Children," the drudgery of life behind the Iron Curtain prior to the then-recent fall of the Soviet empire was explored. A giant hammer and sickle flag led to two oppressed citizens, laboring away in a Soviet gulag under the glare of a fur-capped Red Army soldier to the opening chorale of Alfred Reed's most famous work for concert band, his 1944 "Russian Christmas Music." A photo of a scorning Vladimir Lenin watched over the citizens enjoying their life in the Workers' Paradise. At the emotional climax, the two oppressed members, one working with a sledgehammer and the other a sickle, lifted up those two devices to form the Soviet logo. The male prisoner then took the sledgehammer and proceeded to "destroy" the photo of Lenin. As the people rose up and overthrew the yoke of Communism, the giant hammer and sickle flag passed in front of the photo, revealing the back of the photo, which now read, "THE PARTY'S OVER." This referred to the loss of power of the Communist Party in the USSR. The mallet percussion also played a very short snippet of Jule Styne's "The Party's Over," from the 1956 Broadway production of "Bells Are Ringing." A banner appeared, proclaiming; "NOW THAT'S ART!," poking good-natured fun at some of the highbrowed offerings presented that summer by other units. At the start of "Trepek," a giant white, blue and red-striped Russian flag made a brief appearance, celebrating the return of Mother Russia. The spirited work is one of the most popular of the string of ethnic dances in Tchaikovsky's famous ballet, "The Nutcracker," typically heard during the Christmas season. Sometimes known as "Russian Dance," the fast and lively piece utilizes Ukrainian folk melodies and is based on a Ukrainian dance. Franz Liszt's "Hungarian Rhapsody No. 2" is from the composer's suite of 19 such tunes from 1847, originally written for solo piano. Due to its immediate success, Liszt arranged it for orchestra. At the beginning, members of the color guard and the cymbal line were chased by a bear, which found itself face-to-face with the rifle of an orange-vested hunter. But the bear was in luck, as the hunter was distracted by the alluring appearance of the Valkyrie Brunhilde, a staple in German mythology and Wagnerian operatic productions. A male member of the corps enthusiastically played the female character with ample blond tresses, a helmet with ample horns, and other ample features. The hunter was quite smitten by this angelic sight, much to the bear's relief, but couldn't talk Brunhilde into running away with him. He chased "her" to behind a black wall that served as a changing area for the color guard, and the audience roared in laughter at parts of Brunhilde's costume went flying up in the air from behind the prop. Eight members of the color guard knelt down to perform Santa Clara Vanguard's "Bottle Dance," accompanied by the same music the Santa Clara used the same year in that corps' 25th anniversary production of "Fiddler on the Roof." But it was not to be, as the bear held up a sign proclaiming, "NOT!" The madcap antics just kept coming, as the Wicked Witch of the West made an appearance on a bicycle, to the section of Liszt's dance that sounded like swirling music accompanying a tornado. By this point in the show, anything made sense. During a brief pause, a banner was unrolled stating, "IT AIN'T OVER TIL THE…" Brunhilde released the most amazing stratospheric falsetto warble you've ever heard, triggering the theme from the movie "Jaws" which had earlier appeared in the corps' 1990 show. That year the theme was accompanied by a shark fin that was pulled across the field, the shark hiding under the surface of the field. But the shark that appeared on cue this year, and only for the corps' Finals performance, was a glorious six-foot-long behemoth, mouth opening and closing in anticipation as it locked Brunhilde in its sight. The corps had stayed at a high school in Tennessee for a show less than three weeks from the end of the season, when Velvet Knights staff members spotted the shark sitting in the band room. They asked the band director about it and were told it was made for the band's field show the prior season and if they would get it out of the way, they could have it. The corps loaded it on their equipment truck and kept it under wraps. Even from 10 yards away, the audience anticipated what might happen, and when the shark's mouth started to open and close, it was all but certain. The noise from the audience was deafening as the shark closed in, and when it inhaled Brunhilde in its mighty jaws, her legs flailing in desperation, the audience collectively lost it. For this week only, you can save on the Legacy Collection DVD that contains this complete Velvet Knights performance, along with all finalists from the 1992 DCI World Championships. Discount DVD offer ends Monday, Nov. 18 at 8:30 a.m. ET.